Franz Peter Schubert (German pronunciation: [ˈfʁants ˈʃuːbɛɐ̯t]; January 31, 1797 – November 19, 1828) was an Austrian composer. Although he died at an early age, Schubert was tremendously prolific. He wrote some 600 Lieder, nine symphonies (including the famous "Unfinished Symphony"), liturgical music, operas, some incidental music, and a large body of chamber and solo piano music. Appreciation of his music during his lifetime was limited, but interest in Schubert's work increased dramatically in the decades following his death at the age of 31. Franz Liszt, Robert Schumann, Johannes Brahms and Felix Mendelssohn, among others, discovered and championed his works in the 19th Century. Today, Schubert is admired as one of the leading exponents of the Romantic era in music and he remains one of the most frequently performed composers. Schubert was born in Himmelpfortgrund (now a part of Alsergrund), Vienna on January 31, 1797. His father, Franz Theodor Schubert, the son of a Moravian peasant, was a parish schoolmaster; his mother, Elisabeth Vietz, was the daughter of a Silesian master locksmith, and had also been a housemaid for a Viennese family prior to her marriage. Of Franz Theodor's fourteen children (one illegitimate child was born in 1783), nine died in infancy; five survived. Their father was a well-known teacher, and his school in Lichtental, a part of Vienna's 9th district, was well attended. He was not a musician of fame or with formal training, but he taught his son some elements of music. The house in which Schubert was born, today Nussdorfer Strasse 54, in the 9th district of Vienna. At the age of five, Schubert began receiving regular instruction from his father and a year later was enrolled at his father's school. His formal musical education also began around the same time. His father continued to teach him the basics of the violin, and his brother Ignaz gave him piano lessons. At 7, Schubert began receiving lessons from Michael Holzer, the local church organist and choirmaster. Holzer's lessons seem to have mainly consisted of conversations and expressions of admiration and the boy gained more from his acquaintance with a friendly joiner's apprentice who used to take him to a neighboring pianoforte warehouse where he had the opportunity to practice on better instruments. He also played the viola in the family string quartet, with brothers Ferdinand and Ignaz on violin and his father on the cello. Schubert wrote many of his early string quartets for this ensemble. Schubert first came to the attention of Antonio Salieri, then Vienna's leading musical authority, in 1804, when his vocal talent was recognized. In October 1808, he became a pupil at the Stadtkonvikt (Imperial seminary) through a choir scholarship. At the Stadtkonvikt, Schubert was introduced to the overtures and symphonies of Mozart. His exposure to these pieces and various lighter compositions, combined with his occasional visits to the opera set the foundation for his greater musical knowledge. One important musical influence came from the songs of Johann Rudolf Zumsteeg, who was an important Lied composer of the time, which, his friend Joseph von Spaun reported, he "wanted to modernize". Schubert's friendship with Spaun began at the Stadtkonvikt and endured through his lifetime. In those early days, the more well-to-do Spaun furnished the impoverished Schubert with manuscript paper. Meanwhile, his genius began to show in his compositions. Schubert was occasionally permitted to lead the Stadtkonvikt's orchestra, and Salieri decided to begin training him privately in musical composition and theory in these years. It was the first germ of that amateur orchestra for which, in later years, many of his compositions were written. During the remainder of his stay at the Stadtkonvikt he wrote a good deal of chamber music, several songs, some miscellaneous pieces for the pianoforte and, among his more ambitious efforts, a Kyrie (D. 31) and Salve Regina (D. 27), an octet for wind instruments (D. 72/72a, said to commemorate the 1812 death of his mother), a cantata for guitar and male voices (D. 110, in honor of his father's birthday in 1813), and his first symphony (D. 82). At the end of 1813, he left the Stadtkonvikt, and returned home for studies at the Normalhauptschule to train as a teacher. In 1814, he entered his father's school as teacher of the youngest students. For over two years, the young man endured the drudgery of the work, which he performed with very indifferent success. There were, however, other interests to compensate. He continued to receive private lessons in composition from Salieri, who did more for Schubert’s musical training than any of his other teachers. Salieri and Schubert would part ways in 1817. In 1814, Schubert met a young soprano named Therese Grob, the daughter of a local silk manufacturer. Several of his songs (Salve Regina and Tantum Ergo) were composed for her voice, and she also performed in the premiere of his first Mass (D. 105) in September 1814. Schubert intended to marry Grob, but was hindered by the harsh marriage consent law of 1815, which required the ability to show the means to support a family. In November 1816, after failing to gain a position at Laibach, Schubert sent Grob's brother Heinrich a collection of songs, which were retained by her family into the 20th century. Schubert's most prolific year was probably 1815. He composed over 20,000 bars of music, more than half of which was for orchestra, including nine church works, a symphony, and about 140 Lieder. In that year, he was also introduced to Anselm Hüttenbrenner and Franz von Schober, who would become his lifelong friends. Another friend, Johann Mayrhofer, was introduced to him by Spaun in 1814. Significant changes happened in 1816. Schober, a student of good family and some means, invited Schubert to room with him at his mother's house. The proposal was particularly opportune, for Schubert had just made the unsuccessful application for the post of Kapellmeister at Laibach, and he had also decided not to resume teaching duties at his father's school. By the end of the year, he became a guest in Schober's lodgings. For a time, he attempted to increase the household resources by giving music lessons, but they were soon abandoned, and he devoted himself to composition. "I compose every morning, and when one piece is done, I begin another." During this year, he focused on orchestral and choral works, although he also continued to write Lieder. Much of this work was unpublished, but manuscripts and copies circulated among friends and admirers. In early 1817, Schober introduced Schubert to Johann Michael Vogl, a prominent baritone twenty years Schubert's senior. Vogl, for whom Schubert went on to write a great many songs, became one of Schubert's main proponents in Viennese musical circles. He also met Joseph Hüttenbrenner (brother to Anselm), who also played a role in promoting Schubert's music. These, and an increasing circle of friends and musicians, became responsible for promoting, collecting, and, after his death, preserving, his work. In late 1817, Schubert's father gained a new position at a school in Rossau (not far from Lichtental). Schubert rejoined his father and reluctantly took up teaching duties there. In early 1818, he was rejected for membership in the prestigious Gesellschaft der Musikfreunde, something that might have furthered his musical career. However, he began to gain more notice in the press, and the first public performance of a secular work, an overture performed in February 1818, received praise from the press in Vienna and abroad. Schubert spent the summer of 1818 as music teacher to the family of Count Johann Karl Esterházy at their château in Zseliz (then in Hungary, now in Slovakia). His duties were relatively light (teaching piano and singing to the two daughters, Marie and Karoline), and the pay relatively good. As a result, he happily continued to compose during this time. It may have been at this time that he wrote one of his now world-famous compositions, the Marche militaire No. 1 in D major. On his return from Zseliz, he took up residence with his friend Mayrhofer. The respite at Zseliz led to a succession of compositions for piano duet. The tight circle of friends that Schubert surrounded himself with was dealt a blow in early 1820. Schubert and four of his friends were arrested by the Austrian secret police, who were suspicious of any type of student gatherings. One of Schubert's friends, Johann Senn, was put on trial, imprisoned for over a year, and then permanently banned from Vienna. The other four, including Schubert, were "severely reprimanded", in part for "inveighing against [officials] with insulting and opprobrious language". While Schubert never saw Senn again, he did set some of his poems, "Selige Welt" and "Schwanengesang", to music. The incident may have played a role in a falling-out with Mayrhofer, with whom he was living at the time. The compositions of 1819 and 1820 show a marked advance in development and maturity of style. The unfinished oratorio "Lazarus" (D. 689) was begun in February; later followed, amid a number of smaller works, by the 23rd Psalm (D. 706), the Gesang der Geister (D. 705/714), the Quartettsatz in C minor (D. 703), and the "Wanderer Fantasy" for piano (D. 760). Of most notable interest is the staging in 1820 of two of Schubert's operas: Die Zwillingsbrüder (D. 647) appeared at the Theater am Kärntnertor on June 14, and Die Zauberharfe (D. 644) appeared at the Theater an der Wien on August 21. Hitherto, his larger compositions (apart from his masses) had been restricted to the amateur orchestra at the Gundelhof, a society which grew out of the quartet-parties at his home. Now he began to assume a more prominent position, addressing a wider public. Publishers, however, remained distant, with Anton Diabelli hesitantly agreeing to print some of his works on commission. The first seven opus numbers (all songs) appeared on these terms; then the commission ceased, and he began to receive the meager pittances which were all that the great publishing houses ever accorded to him. The situation improved somewhat in March 1821 when Vogl sang "Der Erlkönig" at a concert that was extremely well received. That month, he composed a variation on a waltz by Anton Diabelli (D. 718), being one of the fifty composers who contributed to Vaterländischer Künstlerverein. The production of the two operas turned Schubert's attention more firmly than ever in the direction of the stage, where, for a variety of reasons, he was almost completely unsuccessful. In 1822, Alfonso und Estrella was refused, partly owing to its libretto. Fierrabras (D. 796) was rejected in the fall of 1823, but this was largely due to the popularity of Rossini and the Italian operatic style, and the failure of Carl Maria von Weber's Euryanthe. Die Verschworenen (D. 787) was prohibited by the censor (apparently on the grounds of its title), and Rosamunde (D. 797) was withdrawn after two nights, owing to the poor quality of the play for which Schubert had written incidental music. Of these works, the two former are written on a scale which would make their performances exceedingly difficult (Fierrabras, for instance, contains over 1,000 pages of manuscript score), but Die Verschworenen is a bright attractive comedy, and Rosamunde contains some of the most charming music that Schubert ever composed. In 1822, he made the acquaintance of both Weber and Beethoven, but little came of it in either case. Beethoven is said to have acknowledged the younger man's gifts on a few occasions, but some of this is likely legend and in any case he could not have known the real scope of Schubert's music - especially not the instrumental works - as so little of it was printed or performed in the composer's lifetime. On his deathbed, Beethoven is said to have looked into some of the younger man's works and exclaimed, "Truly, the spark of divine genius resides in this Schubert!" but what would have come of it if he had recovered we can never know. In the autumn of 1822, Schubert embarked suddenly on a work which more decisively than almost any other in those years showed his maturing personal vision, the "Unfinished Symphony" in B minor. The reason he left it unfinished after two movements and sketches some way into a third remains an enigma, and it is also remarkable that he didn't mention it to any of his friends even though, as Brian Newbould notes, he must have felt thrilled by what he was achieving here. In 1823 Schubert, in addition to Fierrabras, also wrote his first song cycle, Die schöne Müllerin (D. 795), setting poems by Wilhelm Müller. This series, together with the later cycle "Winterreise" (D. 911, also setting texts of Müller in 1827) is widely considered one of the pinnacles of Lieder. He also composed the song Du bist die Ruh ("You are stillness/peace") D. 776 during this year. Also in that year, symptoms of syphilis first appeared. In the spring of 1824 he wrote the Octet in F (D. 803), "A Sketch for a Grand Symphony"; and in the summer went back to Zseliz. There he became attracted to Hungarian musical idiom, and wrote the Divertissement à la hongroise (D. 818) for piano duet and the String Quartet in A minor (D. 804). Despite his preoccupation with the stage, and later with his official duties, he found time during these years for a significant amount of composition. He completed the Mass in A flat (D. 678) and, in 1822, began the "Unfinished Symphony" (Symphony No. 8 in B minor, , D. 759). Why the symphony was "unfinished" has been debated endlessly without resolution. In 1824, he wrote the variations for flute and piano on "Trockne Blumen", from the cycle Die schöne Müllerin, and several string quartets. He also wrote the Arpeggione Sonata (D. 821), at a time when there was a minor craze over that instrument. The setbacks of previous years were compensated for by the prosperity and happiness of 1825. Publication had been moving more rapidly; the stress of poverty was for a time lightened; and in the summer he had a pleasant holiday in Upper Austria, where he was welcomed with enthusiasm. It was during this tour that he produced his "Songs from Sir Walter Scott". This cycle contains Ellens dritter Gesang (D. 839), a setting of Adam Storck's German translation of Scott's hymn from The Lady of the Lake, which is widely, though mistakenly, referred to as "Schubert's Ave Maria". It opens with the greeting Ave Maria, which recurs in the refrain; the entire Scott/Storck text in Schubert's song is frequently substituted with the complete Latin text of the traditional Ave Maria prayer. 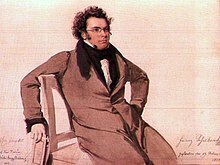 In 1825, Schubert also wrote the Piano Sonata in A minor (Op. 42, D. 845), and began the "Great" C major Symphony (Symphony No. 9, D. 944), which was completed the following year. From 1826 to 1828, Schubert resided continuously in Vienna, except for a brief visit to Graz in 1827. The history of his life during these three years was relatively uneventful, and is little more than a record of his compositions. In 1826, he dedicated a symphony (D. 944, that later came to be known as the "Great") to the Gesellschaft der Musikfreunde and received an honorarium in return. In the spring of 1828, he gave, for the first and only time in his career, a public concert of his own works, which was very well received. The compositions themselves are a sufficient biography. The String Quartet in D minor (D. 810), with the variations on Death and the Maiden, was written during the winter of 1825–1826, and first played on 25 January 1826. Later in the year, came the String Quartet in G major, (D. 887, Op. 161), the "Rondeau brillant" for piano and violin (D. 895, Op. 70,), and the Piano Sonata in G (D. 894, Op. 78) (first published under the title "Fantasia in G"). To these should be added the three Shakespearian songs, of which "Hark! Hark! the Lark" (D. 889) and "An Sylvia" (D. 891) were allegedly written on the same day, the former at a tavern where he broke his afternoon's walk, the latter on his return to his lodging in the evening. In 1827, Schubert wrote the song cycle Winterreise (D. 911), a colossal peak of the art of art song ("remarkable" was the way it was described at the Schubertiades), the Fantasia for piano and violin in C (D. 934), the Impromptus for piano, and the two piano trios (the first in B flat (D. 898), and the second in E flat, D. 929); in 1828 the Mirjams Siegesgesang (Song of Miriam, D. 942) on a text by Franz Grillparzer, the Mass in E-flat (D. 950), the Tantum Ergo (D. 962) in the same key, the String Quintet in C (D. 956), the second Benedictus to the Mass in C, the last three piano sonatas, and the collection of songs published posthumously as Schwanengesang ("Swan-song", D. 957). This collection, while not a true song cycle, retains a unity of style amongst the individual songs, touching depths of tragedy and of the morbidly supernatural which had rarely been plumbed by any composer in the century preceding it. Six of these are set to words by Heinrich Heine, whose Buch der Lieder appeared in the autumn. The Symphony No. 9 (D. 944) is dated 1828, but Schubert scholars believe that this symphony was largely written in 1825–1826 (being referred to while he was on holiday at Gastein in 1825 - that work, once considered lost, now is generally seen as an early stage of his C major symphony) and was revised for prospective performance in 1828. This was a fairly unusual practice for Schubert, for whom publication, let alone performance, was rarely contemplated for most of his larger-scale works during his lifetime. In the last weeks of his life, he began to sketch three movements for a new Symphony in D (D. 936A). The works of his last two years reveal a composer increasingly meditating on the darker side of the human psyche and human relationships, and with a deeper sense of spiritual awareness and conception of the 'beyond'. He reaches extraordinary depths in several chillingly dark songs of this period, especially in the larger cycles. For example, the song Der Doppelgänger reaching an extraordinary climax, conveying madness at the realization of rejection and imminent death - a stark and visionary picture in sound and words that had been prefigured a year before by "Der Leiermann" (The Hurdy-Gurdy Man) at the end of Winterreise - and yet the composer is able to touch repose and communion with the infinite in the almost timeless ebb and flow of the String Quintet and his last three piano sonatas, moving between joyful, vibrant poetry and remote introspection. Even in large-scale works he was sometimes using increasingly sparse textures; Newbould compares his writing in the fragmentary Tenth Symphony (D.936A), probably the work of his very last two months) with Mahler's use of folksong-like harmonics and bare soundscapes. Schubert expressed the wish, were he to survive his final illness, to further develop his knowledge of harmony and counterpoint, and had actually made appointments for lessons with the counterpoint master Simon Sechter. In the midst of this creative activity, his health deteriorated. The cause of his death was officially diagnosed as typhoid fever, though other theories have been proposed, including the tertiary stage of syphilis. By the late 1820s Schubert's health was failing and he confided to some friends that he feared that he was near death. In the late summer of 1828, the composer saw court physician Ernst Rinna, who may have confirmed Schubert's suspicions that he was ill beyond cure and likely to die soon.. Some of his symptoms matched those of mercury poisoning (mercury was then a common treatment for syphilis, again suggesting that Schubert suffered from it). At the beginning of November he again fell ill, experiencing headaches, fever, swollen joints, and vomiting. He was generally unable to retain solid food and his condition worsened. Schubert died in Vienna, at age 31, on November 19, 1828, at the apartment of his brother Ferdinand. The last musical work he had wished to hear was Beethoven's String Quartet No.14 in C sharp minor, Op. 131; his friend, violinist Karl Holz, who was present at the gathering, 5 days before Schubert's death, commented: "The King of Harmony has sent the King of Song a friendly bidding to the crossing". It was next to Beethoven, whom he had admired all his life, that Schubert was buried by his own request, in the village cemetery of Währing. In 1872, a memorial to Franz Schubert was erected in Vienna's Stadtpark. In 1888, both Schubert's and Beethoven's graves were moved to the Zentralfriedhof, where they can now be found next to those of Johann Strauss II and Johannes Brahms. The cemetery in Währing was converted into a park in 1925, called the Schubert Park, and his former grave site was marked by a bust. Schubert wrote almost 1000 works in a remarkably short career. The largest number (over 600) of these are songs. He wrote seven complete symphonies, as well as the two movements of the "Unfinished" Symphony, a complete sketch (with partial orchestration) of a ninth, and arguable fragments of a 10th. There is a large body of music for solo piano, including 21 complete sonatas and many short dances, and a relatively large set of works for piano duet. There are nearly 30 chamber works, including some fragmentary works. His choral output includes six masses. He wrote only five operas, and no concertos. In July 1947 the twentieth-century composer Ernst Krenek discussed Schubert's style, abashedly admitting that he at first "shared the wide-spread opinion that Schubert was a lucky inventor of pleasing tunes ... lacking the dramatic power and searching intelligence which distinguished such 'real' masters as Bach or Beethoven". Krenek wrote that he reached a completely different assessment after close study of Schubert's songs at the urging of friend and fellow composer Eduard Erdmann. Krenek pointed to the piano sonatas as giving "ample evidence that [Schubert] was much more than an easy-going tune-smith who did not know, and did not care, about the craft of composition." Each sonata then in print, according to Krenek, exhibited "a great wealth of technical finesse" and revealed Schubert as "far from satisfied with pouring his charming ideas into conventional molds; on the contrary he was a thinking artist with a keen appetite for experimentation." That "appetite for experimentation" manifests itself repeatedly in Schubert's output in a wide variety of forms and genres, including opera, liturgical music, chamber and solo piano music, and symphonic works. Perhaps most familiarly, his adventurousness manifests itself as a notably original sense of modulation, as in the second movement of the String Quintet, where he modulates from C major, through E major, to reach the tonic key of C♯ major. It also appears in unusual choices of instrumentation, as in the Arpeggione Sonata or the unconventional scoring of the Trout Quintet. If it not infrequently led Schubert up blind alleys, resulting in fragmentary works, it also enabled him to create music unlike anything that had come before, such as his two song cycles of unprecedented scope. It was in the genre of the Lied, however, that Schubert made his most indelible mark. Plantinga remarks, "In his more than six hundred Lieder he explored and expanded the potentialities of the genre as no composer before him." Prior to Schubert's influence, Lieder tended toward a strophic, syllabic treatment of text, evoking the folksong qualities burgeoned by the stirrings of Romantic nationalism. Among Schubert's treatments of the poetry of Goethe, his settings of Gretchen am Spinnrade and Der Erlkönig are particularly striking for their dramatic content, forward-looking uses of harmony, and their use of eloquent pictorial keyboard figurations, such as the depiction of the spinning wheel and treadle in the piano in Gretchen and the furious and ceaseless gallop in Erlkönig. Also of particular note are his two song cycles on the poems of Wilhelm Müller, Die schöne Müllerin and Winterreise, which helped to establish the genre and its potential for musical, poetic, and almost operatic dramatic narrative. The Theaterzeitung, writing about Winterreise at the time, commented that it was a work that "none can sing or hear without being deeply moved". Antonín Dvořák wrote in 1894 that Schubert, whom he considered one of the truly great composers, was clearly influential on shorter works, especially Lieder and shorter piano works: "The tendency of the romantic school has been toward short forms, and although Weber helped to show the way, to Schubert belongs the chief credit of originating the short models of piano forte pieces which the romantic school has preferably cultivated. [...] Schubert created a new epoch with the Lied. [...] All other songwriters have followed in his footsteps." Schubert's compositional style progressed rapidly throughout his short life. The loss of potential masterpieces caused by his early death at 31 was perhaps best expressed in the epitaph on his large tombstone written by the poet Franz Grillparzer, "Here music has buried a treasure, but even fairer hopes." Schubert's chamber music continues to be popular. In a poll of classical music listeners announced in October 2008, the ABC in Australia found that Schubert's chamber works dominated the field, with the Trout Quintet coming first, followed by two of his other works. Some of his smaller pieces were printed shortly after his death, but the manuscripts of many of the longer works, whose existence was not widely known, remained hidden in cabinets and file boxes of Schubert's family, friends, and publishers. Even some of Schubert's friends were unaware of the full scope of what he wrote, and for many years he was primarily recognized as the "prince of song", although there was recognition of some of his larger-scale efforts. In 1838 Robert Schumann, on a visit to Vienna, found the dusty manuscript of the C major symphony (the "Great", D. 944) and took it back to Leipzig, where it was performed by Felix Mendelssohn and celebrated in the Neue Zeitschrift. The most important step towards the recovery of the neglected works was the journey to Vienna which Sir George Grove (widely known for the Grove Dictionary of Music and Musicians) and Arthur Sullivan made in the autumn of 1867. The travellers rescued from oblivion seven symphonies, the Rosamunde incidental music, some of the Masses and operas, some of the chamber works, and a vast quantity of miscellaneous pieces and songs. This led to more widespread public interest in Schubert's work. From the 1830s through the 1870s, Franz Liszt transcribed and arranged a number of Schubert's works, particularly the songs. Liszt, who was a significant force in spreading Schubert's work after his death, said Schubert was "the most poetic musician who ever lived." Schubert's symphonies were of particular interest to Antonín Dvořák, with Hector Berlioz and Anton Bruckner acknowledging the influence of the "Great" Symphony. In 1897, the publisher Breitkopf & Härtel released a critical edition of Schubert's works, under the general editing of Johannes Brahms, enabling a wider dissemination of his music. In the 20th century, composers such as Benjamin Britten, Richard Strauss, and George Crumb either championed or paid homage to Schubert in their work. Britten, an accomplished pianist, accompanied many of Schubert's Lieder and performed many piano solo and duet works. Some of the disagreement continued into the 20th century. George Grove in his 1908 Dictionary of Music and Musicians, assigned the Great as number 10, and the Unfinished as number 9. (It is unclear from his article which symphonies, fragmentary or otherwise, are numbers 7 and 8.) However, the Unfinished is now generally referred to as number 8 in the English-speaking world, with the Great at number 9. Number 10 is generally acknowledged to be the D. 936a fragment, for which a completion by Brian Newbould exists. The 1978 revision to the Deutsch catalog leaves D. 827 without a number (in spite of numerous completions), and assigns number 7 to the Unfinished and number 8 to the Great. As a consequence, generally available scores for the later symphonies may be published using conflicting numbers. Grove and Sullivan also suggested that there may have been a "lost" symphony. Immediately before Schubert's death, his friend Eduard von Bauernfeld recorded the existence of an additional symphony, dated 1828 (although this does not necessarily indicate the year of composition) named the "Letzte" or "Last" symphony. Brian Newbould believes that the "Last" symphony refers to a sketch in D major (D. 936A), identified by Ernst Hilmar in 1977, and which was realised by Newbould as the Tenth Symphony. The fragment was bound with other symphony fragments (D. 615 and D. 708a) that Schubert had apparently intended to combine. In 1897, the 100th anniversary of Schubert's birth was marked in the musical world by festivals and performances dedicated to his music. In Vienna, there were ten days of concerts, and the Emperor Franz Joseph gave a speech recognizing Schubert as the creator of the art song, and one of Austria's favorite sons. Karlsruhe saw the first production of his opera Fierrabras. In 1928, Schubert week was held in Europe and the United states to mark the centenary of the composer's death. Works by Schubert were performed in churches, in concert halls, and on radio stations. A competition, with top prize money of $10,000 and sponsorship by the Columbia Phonograph Company, was held for "original symphonic works presented as an apotheosis of the lyrical genius of Schubert, and dedicated to his memory". The winning entry was Kurt Atterberg's sixth symphony. In 1977, the German electronic band Kraftwerk recorded a tribute song called "Franz Schubert", which can be found on the album Trans-Europe Express. Since relatively few of his works were published in Schubert's lifetime, only a small number of them have opus numbers assigned, and, even in those cases, the sequence of the numbers does not give a good indication of the order of composition. In 1951, musicologist Otto Erich Deutsch published a "thematic catalogue" of Schubert's works that lists his compositions numerically by their composition date. ^ Rita Steblin, "Franz Schubert – das dreizehnte Kind", Wiener Geschichtsblätter, 3/2001, pp. 245–265. ^ Wilberforce (1866), p. 2 "the school was much frequented"
^ Hadow, William Henry (1911). "Franz Schubert". Encyclopedia Britannica. 24. London, New York: The Encyclopedia Britannica Company. pp. 380. ^ Brian Newbould, Schubert: The Music and the Man, UCLA Press, 1997, discusses Schubert's medical history and his death; leans toward Schubert's contracting syphilis in 1822 and dying from it, while judging the evidence not quite conclusive. ^ Deutsch O.E. Schubert: Memoirs by his friends, p. 300. London, 1959. ^ Plantinga, Leon (1984). Romantic Music: A History of Musical Style in Nineteenth-Century Europe. Norton. pp. 117. ^ "The Classical Music Chamber Music 100". Australian Broadcasting Co.. http://www.abc.net.au/classic/classic100/chamber/100list.htm. Retrieved 2010-08-24. ^ a b Kreissle, pp. 297–332, in which Grove recounts his visit to Vienna. ^ See e.g. Kreissle, p. 324, where Grove describes current (1860s) interest in Schubert's work, and Gibbs (1997), pp. 250–251, describing the size and scope of the 1897 Schubert centennial commemorations. ^ See references below for citations containing different numbers for the Unfinished Symphony. ^ a b "Schubert Ecstasy". Time. 3 December 1928. http://www.time.com/time/magazine/article/0,9171,928288,00.html. Retrieved 8 April 2009. Kreissle von Hellborn, Heinrich (1865). Franz Schubert. Carl Gerold's Sohn. http://www.google.de/books?id=QbwTAAAAYAAJ. The first significant biography of Schubert. This edition is available at German Google Books. English translations and abridgements of this biography from the 1860s are available at Google Books. The second volume is notable in that it contains Sir George Grove's description of the trip to Vienna in which he recovered a number of Schubert's works. Austin, George Lowell (1873). The Life of Franz Schubert. Shepard and Gill. OCLC 4450950. http://books.google.com/?id=Ka4NAAAAYAAJ. Duncan, Edmondstoune (1905). Schubert. J.M. Dent. OCLC 2058050. http://books.google.com/?id=CldMAAAAMAAJ. Dvořák, Antonín (July 1894). "Franz Schubert". Century Illustrated Magazine (Cairns Collection of American Women Writers) 48 (3). OCLC 4279873. http://books.google.com/?id=qHcAAAAAYAAJ. Frost, Henry Frederic (1915). Schubert. Scribner. OCLC 45465176. http://books.google.com/?id=npc5AAAAIAAJ. Grove, George; Fuller-Maitland,John Alexander (1908). Grove's Dictionary of Music and Musicians, volume 4. Macmillan. OCLC 407077. http://books.google.com/?id=FBsPAAAAYAAJ. Rodenberg, Julius; Pechel, Rudolf (1900). Deutsche Rundschau, volume 102 (Jan–Mar 1900). Gebrüder Paetel. OCLC 1566444. http://books.google.com/?id=7UEVAAAAYAAJ. Thayer, Alexander Wheelock; Krehbiel, Henry E.;Deiters, Hermann; Riemann, Hugo (1921). The Life of Ludwig Van Beethoven: vol 3. The Beethoven Association. OCLC 422583. http://books.google.com/?id=rRkUAAAAYAAJ. Musical Times. 38. Novello. February 1897. OCLC 1608351. http://books.google.com/?id=aco7mI9EM50C&pg=PA242&dq=Mottl+Fierrabras#PPA113,M1. Chisholm, Hugh, ed (1911). "Schubert, Franz Peter". Encyclopædia Britannica (Eleventh ed.). Cambridge University Press. "Franz Schubert". Catholic Encyclopedia. New York: Robert Appleton Company. 1913. Brown, A. Peter (2002). The Symphonic Repertoire. Indiana University Press. ISBN 9780253334879. Deutsch, Otto Erich; et al. (1978). Franz Schubert, thematisches Verzeichnis seiner Werke in chronologischer Folge. Bärenreiter. ISBN 9783761805718. Emmons, Shirlee; Lewis,Wilbur Watkin (2006). Researching the Song: A Lexicon. Oxford University Press US. ISBN 9780195152029. Ewen, David (2007). Composers of Yesterday. READ BOOKS. ISBN 9781406759877. Gammond, Peter (1982). Schubert. Methuen. ISBN 0-413-46990-5. Gibbs, Christopher H. (2000). The Life Of Schubert. Cambridge University Press. ISBN 0-521-59512-6. Gibbs, Christopher H. [ed.] (1997). The Cambridge Companion to Schubert. Cambridge University Press. ISBN 9780521484244. Lev, Ray (1947). Album notes for Franz Schubert — Piano Sonata no. 15 in C Major (Unfinished); Allegretto in C Minor — Ray Lev, Pianist [78 RPM]. United States: Concert Hall Society (Release B3). Lindmayr-Brandl, Andrea (2003) (in German). Franz Schubert: Das fragmentarische Werk. Franz Steiner Verlag. ISBN 9783515082501. http://books.google.com/?id=cUgvGaSYCJ8C. Liszt, Franz; Suttoni, Charles (translator, contributor) (1989). An Artist's Journey: Lettres D'un Bachelier ès Musique, 1835–1841. University of Chicago Press. ISBN 0226485102. http://books.google.com/?id=bXpPOj-Y7nkC. Newbould, Brian (1999). Schubert: The Music and the Man. University of California Press. ISBN 0-520-21957-0. Schonberg, Harold C (1997). The Lives of the Great Composers. W. W. Norton. ISBN 9780393038576. http://books.google.com/?id=VawrK1CRFJgC. Smith, Jane Stuart; Carlson, Betty; Schaeffer, Francis A (1995). The Gift of Music: Great Composers and Their Influence. Good News Publishers. ISBN 9780891078692. Steblin, Rita (1998). "Schubert's Relationship with Women: An Historical Account". in Newbould, Brian. Schubert Studies. Ashgate. pp. 159–182. ISBN 9781859282533. Steblin, Rita (1998). "In Defense of Scholarship and Archival Research: Why Schubert's Brothers Were Allowed to Marry". Current Musicology 62: 7–17. Swafford, Jan (1992). The Vintage Guide to Classical Music. Vintage Books. ISBN 0-679-72805-8. "Trans-Europe Express track listing". http://www.discogs.com/Kraftwerk-Trans-Europe-Express/release/1631474. Retrieved 2009-04-09. The following citations illustrate the confusion around the numbering of Schubert's late symphonies. The B minor Unfinished Symphony is variously published as Number 7 and Number 8, in both German and English. All of these editions appeared to be in print (or at least somewhat readily available) in 2008. Schubert, Franz (1996) (in German). Symphony, No 7, D 759, B Minor, "Unfinished". Bärenreiter. OCLC 39794412. German-language publication of the Unfinished Symphony score as Number 7. Schubert, Franz (2008). Symphony No. 7 in B Minor D 759 Unfinished Symphony. Eulenburg Audio+Score Series. Eulenburg. ISBN 978-3795765293. English-language publication of the Unfinished Symphony score as Number 7. Schubert, Franz; Reichenberger, Teresa (1986) (Paperback). Symphony No. 8 in B minor, D. 759 Unfinished. ISBN 978-3795762780. English-language publication of the Unfinished Symphony score as Number 8. Otto Erich Deutsch, working in the first half of the 20th century, was probably the preeminent scholar of Schubert's life and music. In addition to the catalog of Schubert's works, he collected and organized a great deal of material about Schubert, some of which is still in print. Deutsch, Otto Erich; Wakeling, Donald R. (1995). The Schubert Thematic Catalogue. Courier Dover Publications. ISBN 9780486286853. Deutsch, Otto Erich; Blom, Eric (translator) (1977). Schubert: A Documentary Biography. Da Capo Press. ISBN 9780306774201. Deutsch, Otto Erich (1998). Schubert: Memoirs by His Friends. Oxford University Press. ISBN 9780198164364. Schubert, Franz; Deutsch, Otto Erich; Savile, Venetia (translator) (1928). Franz Schubert's Letters and Other Writings. A. A. Knopf. OCLC 891887. Elizabeth Norman McKay and Brian Newbould have done a great deal of research on the life and music of Schubert in recent years, including scholarly journal articles and books. Newbould made a completion of Schubert's fragmentary 10th symphony. McKay, Elizabeth Norman (1991). Franz Schubert's music for the theatre. H. Schneider. ISBN 978-3795206642. McKay, Elizabeth Norman (1996). Franz Schubert: A Biography. Oxford University Press. ISBN 9780198166818. Newbould, Brian (1997). Schubert: The Music and the Man. University of California Press. ISBN 9780520219571. Newbould, Brian (1998). Schubert Studies. Ashgate. ISBN 9781859282533. Newbould, Brian (1992). Schubert and the Symphony: A New Perspective. Toccata Press. ISBN 9780907689263. Newbould, Brian (2003). Schubert the Progressive: History, Performance Practice, Analysis. Ashgate. ISBN 9780754603689. Ernst Hilmar, Otto Brusatti (Hrsg., mit einer Einleitung von Walter Obermaier): Franz Schubert. Ausstellung der Wiener Stadt- und Landesbibliothek zum 150. Todestag des Komponisten. Katalog. Wien 1978. Schubert cylinder recordings, from the Cylinder Preservation and Digitization Project at the University of California, Santa Barbara Library. This article is licensed under the GNU Free Documentation License. It uses material from the Wikipedia article "Franz Schubert. Allthough most Wikipedia articles provide accurate information accuracy can not be guaranteed.